Congratulations, Spain!! I'm sad that the World Cup is over (how boring to think of going back to the usual sports...please catch on here, futball.) South Africa was a wonderful host country. Thank you! Would it be considered cheating if I said that I love dark chocolate and mint almost as much as dark chocolate and peanut butter? Sticking in the word 'almost' should turn it into a neutral statement. Unfortunately the same can't be said about that dark horse duo, chocolate/raspberry. The mint and berries will have to duke it out on their own while dark chocolate and I find a quite place all to ourselves. Peanut butter, you're invited too. It doesn't really matter what your preferences are when it comes to chocolate's perfect mate (in the long run, will anything be good enough for our beloved dark chocolate?) I know that not everyone is a chocolate/mint groupie. If you fall into that category, please don't write off these brownies just yet. 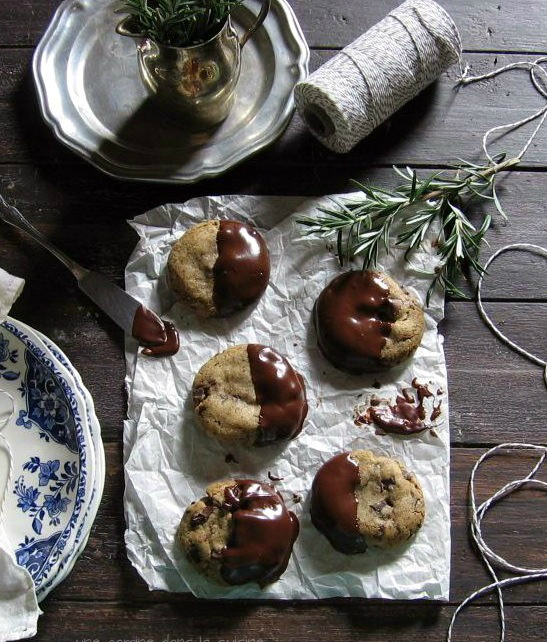 There is plenty of chocolate love at work in this recipe to compensate for any peppermint prejudice. Don't think you can go wrong with chocolate & anything but must admit I'm rather partial to the mint & choc combo (has to be dark chocolate though). I didn't think I was a mint/chocolate fan until I made these. I agree - there's a bunch of chocolate in these - and love how you've presented them - they look wonderful! Not sure if they'll surpass the PB & C, but they come pretty close. What a fun variation on brownies! I'll keep this one in mind for my peppermint fans. 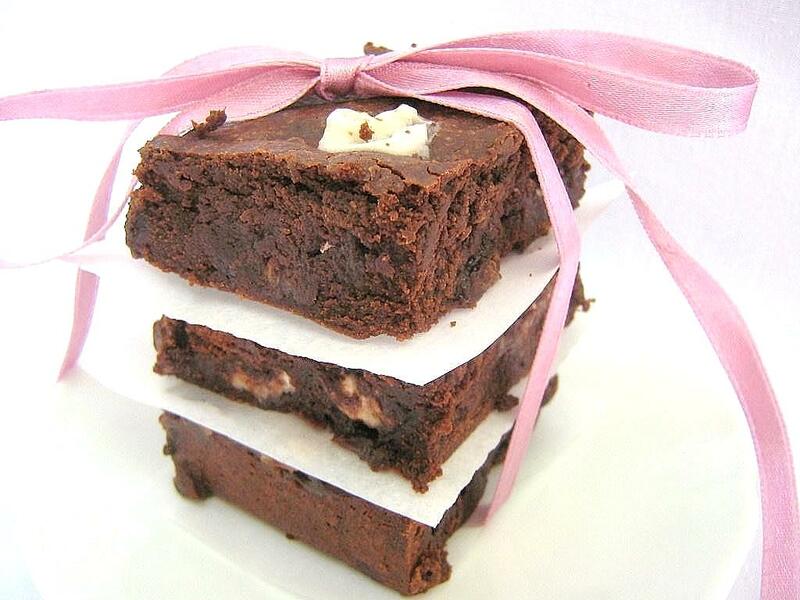 Beautiful photographs of yummy fudgy brownies - they look delicious! 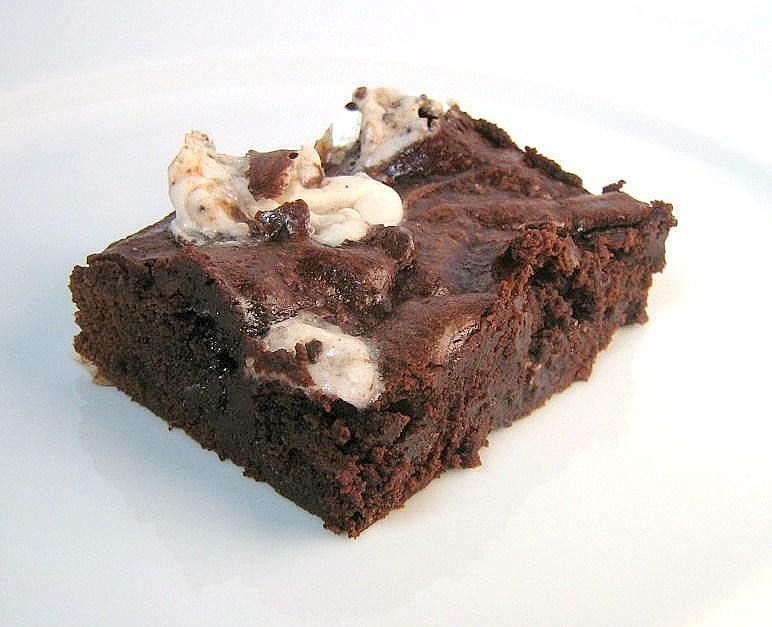 There's something about mint in a brownie that I really like. I've never made this particular recipe, Valerie, but Maida Heatter has a wonderful brownie recipe in which she uses a layer of mints. I like the mint much better than pb! Gorgeous photo with that ribbon! Love it! Your brownies look beautiful! So glad you enjoyed them!! Those look so pretty all wrapped up in a pink bow. My hubby and son have been glued to the World Cup. I am kind of glad it's over as I can finally watch some of my own shows! I have to admit to being a huge fan of chocolate and mint, chocolate and peanut butter and chocolate and raspberries. Guess that makes me a chocoholic! Chocolate and raspberry is really my very favorite. :) I am glad you liked these! Thanks for baking with me this week! Your brownies look fantastic and I love your presentation! You have got to stop this, you're making me fat mentally, LOL. 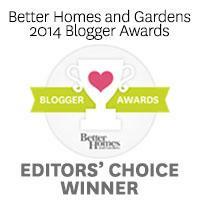 But I wanted to let you I honored you with a blog award today. Enjoy. I'm usually not a fan of chocolate and mint (gasp! I know), but these cookies look awesome. I adore mint and chocolate; I love mint chocolate chip ice cream. I'm all about peanut butter in my chocolate but the hubby loves him some mint! 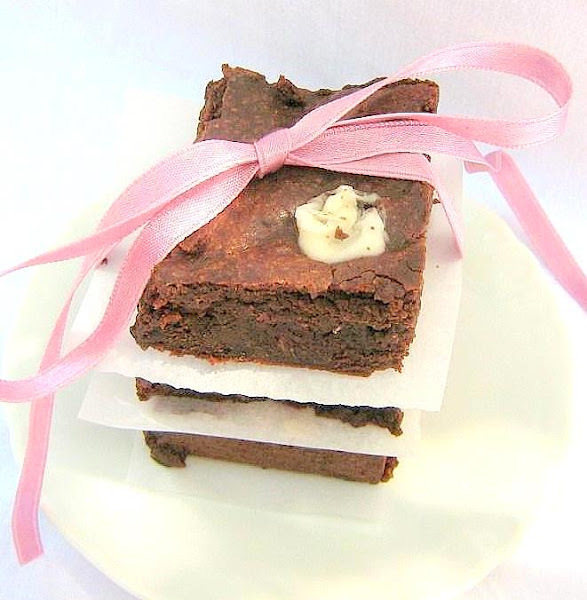 :) Love the ribbon around your brownies. Your brownies are so beautifully presented! The mint chocolate combo is one of my favourites. Valerie, Valerie! I just realized your'e not in my sidebar. I'm such a jerk! I'm putting you there now, as you are my favoritest sweets person and blog (smile)...! No worries, Stella. :D Thanks! Oh! So pretty, all dressed up in that ribbon! That first picture looks so pretty! I'm going to try it soon! Picture perfect. These were really good brownies.